There are several expressions in the American lexicon that express how fleeting our time on this Earth is, how this temporal life is short. The grand old soap opera, Days of Our Lives, has as their catchphrase, “Like sands through the hourglass, so are the days of our lives.” Life measured by the grains of sand slip through one side of the hourglass to the other in a flash. 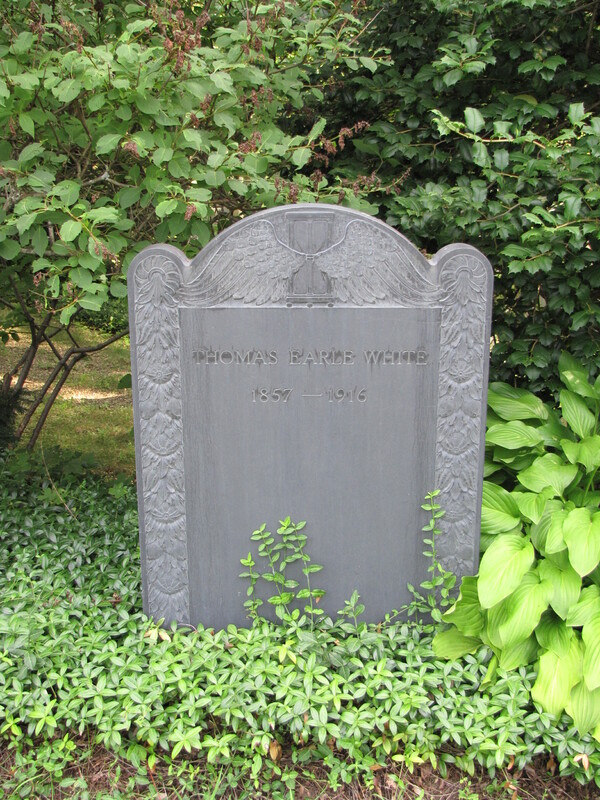 The hourglass symbol on a gravestone, often shown with wings, as it here, represents the same thought of time fleeting by quickly reminding us of the expression “Time Flies”. This symbol, a winged hourglass, brings that expression to life, so to speak. A reminder in stone that life is short and that time is fleeting, every minute of every day brings one closer and closer to death. It is also an admonition to us NOT to put off making that phone call to an ailing parent, sending that letter to a distant friend, mailing that birthday card even if it’s a day late, getting that present purchased and wrapped to celebrate an anniversary, or the simple act of telling those who you love that you do before it is too late and time has taken flight. 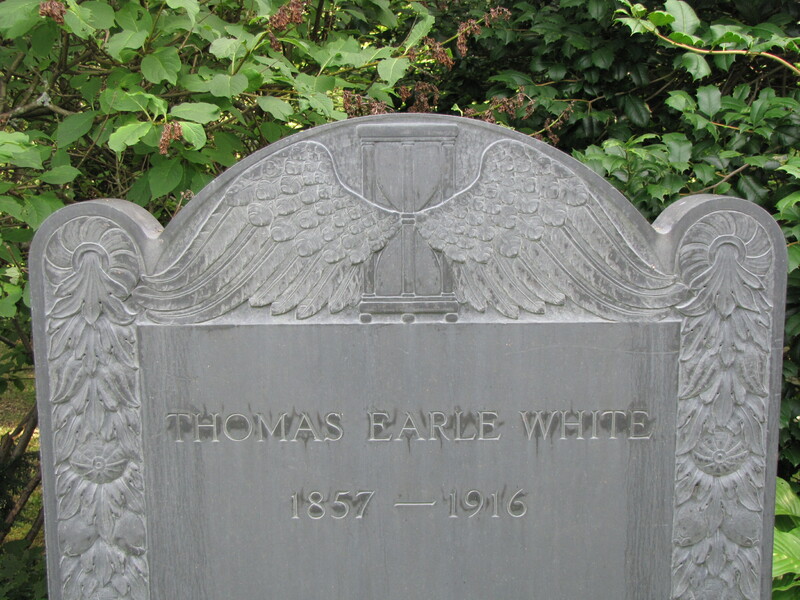 Thank you for posting these photos of Thomas Earle White’s grave. Thomas was a lawyer whose family had included several important anti-slavery leaders. His mother Caroline Earle White was a pioneer for the humane treatment of animals and animal shelters. As a young lawyer, Thomas was involved in Philadelphia’s anarchist movement, as was his first cousin and friend Laura H. Earle. The winged hourglass is particularly fitting as an ornament on this grave because Thomas died suddenly of a heart attack while dancing. News reports noted also that he had just inherited a million dollars from his mother, who had passed about a year earlier. Seven of Thomas Earle White’s family members are buried at Woodlands Cemetery, close to my home in Philadelphia. I am very pleased to discover this post about his grave. Thank you so much for adding to the story with rich family details about Thomas Earle White. OH you’re very welcome, friend. I just spotted your note this minute. Kudos for your fine web site. Thank you for posting about Thomas Earle White. As I am researching my family history, I have found some amazing information on my Earle White family. He was my great grandfather. I am very pleased to get your note because I have been hoping to find descendants of the Earles of Germantown (Philadelphia). Your great grandfather Thomas Earle White was one of many very interesting and distinguished family members, as you probably know well. Some who I didn’t mention here were Thomas Earle the abolitionist, his daughter Phebe Earle Gibbons the abolitionist and author, and the three George Earles, last of whom was Governor of PA. But please let’s share information, especially about Laura H. Earle (1858-1911). I know quite a lot about Laura, and she is the Earle in whom I’ve been most interested. She was a gifted pianist; studied music at Weimar, Germany in her teens; was badly injured when thrown from a horse, took several months to recover; fell in love with a certain Horace but he gave no encouragement; performed music at fundraising that I know about; was a believer in Free Love (radical ideas then, commonplace now); made a winter home in Florida and died there. Laura’s death is a complicated story that I have researched thoroughly, but it’s still incomplete. Sallie, my email address is gpzero57@gmail.com. I hope this note of mine is not too long, and also that you will tell me what you think. Hi. I contacted you via email with a few questions. I think that TEW and CEW died in the same year; the mother predeceased the son by a month, if I’m not mistaken.